Hezbollah recruits - ready to take on the Israeli navy? Pipes said Lebanon must be viewed in connection with the popular protests destabilizing neighboring Syria for the past four months. "Should the Bashar Assad regime hold out and prevail, Hezbollah will presumably continue to strengthen. 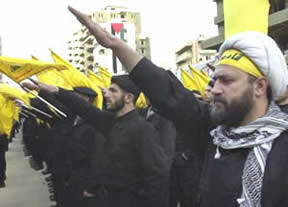 But that's the question – Hezbollah's very future is connected to the Assad regime," Pipes said by telephone from Philadelphia. Were the Syrian president to be toppled, he said, "Hezbollah would lose its patron and have to be more careful. I don't think we can talk about Lebanon on its own now – we have to wait and see what the denouement in Syria is. I'm inclined to think the regime is in major trouble. Things are pretty bleak for the Assad family – I wouldn't count them out yet, but I wouldn't bet on them.